How can you, your Church, group or organisation support the work of the Waterways Chaplains? Have a look here for some inspiration. Is your Church fairly near to a river or canal? You could join with us and maybe have a Waterways Champion through whom you could help practically and spiritually, supporting our work on your ‘patch’. You might additionally designate one day a year where you remember the work on the waterways to reflect on what has previously happened, encourage new recruits and reflect on how better you could help in the new year. In June 2016, St Paul’s Church, Coven, Wolverhampton, signed a Mission Partnership Agreement to help the Waterways Chaplaincy particularly in their area. They have already held prayer walks along the canal, talked to boaters and blessed boats. Here is Senior Chaplain Revd. 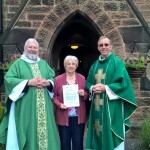 Mark Chester with Fr Malcolm Lockey and the Church Warden Mary Parton. Would you like to hear directly from a Waterways Chaplain? We would be very happy to come and speak to your group and tell you about the work God is doing on the waterways. Please contact us here to look into this. Are you a Christian, a good listener and able to walk a mile of the waterways near you a week? Chaplains share in the good and bad times and are supportive and encouraging of all, regardless of religion, orientation or race. They support people of all faiths and none and are happy to discuss spiritual and practical matters if invited to do so. Sign up to find your local waterways chaplain and find out what is going on in your area so you can pray about this essential work. Regular giving helps to keep this voluntary work going. We are always happy to receive practical help e.g. offer to help fix engines if in area, fuel, sleeping bags etc or financial support for this essential growing work. Please click here for ways to help. And to many other Churches and individuals who give sacrificially.